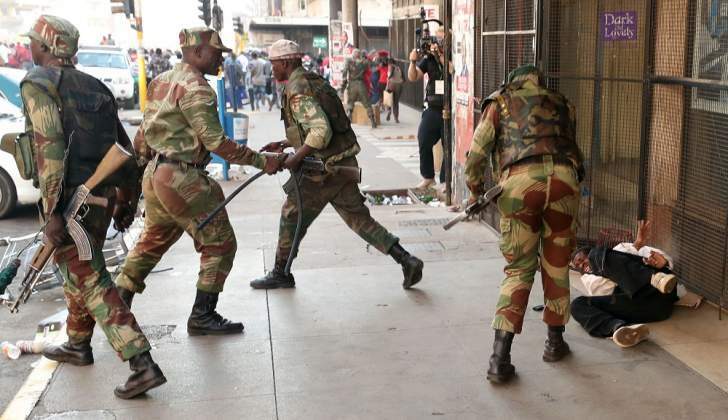 The mayhem which occurred in Harare and Bulawayo is the result of a clueless government which cannot incline an ear to the grievances of the people who have been on the brunt of suffering and are forced to face brutal response from a ruthless security force. The army should confine itself to boarders. What is happening in Zimbabwe right now is human cruelty, barbaric, ungodly and unethical. The whole government and its armed forces are cruel criminals who deserve to be arrested and tried before a court. . May the Almighty God intervene and save us from this ruthless government which has caused a lot of people suffering. It's a shame the second republic is proving to be worse than all ever imagined. Imagine during the last three days business people lost valuable money as they could not access the internet. People resorted to dictating a document to their respective clients in Zimbabwe via the phone. In this era of technology sure such kind of behaviour exhibited by the state is gross human rights abuse. There was no email service. Even the tourism sector was heavily affected and that means tourists had to think twice or alternatively choose another country to visit. Is Zimbabwe really open for business? The root cause of all these problem are stemming from the issue of legitimacy where an election was stolen. Zanu PF is now using the state machinery to silence the opposition and make them suffer in anguish. It has been reported that about 9 people where shot dead and a number of people injured. We don't know the atrocities committed during the time when there was Internet blackout and people could not communicate. We call for the muscle of South Africa and Sadc to quickly call Zanu PF & MDC -Alliance to a negotiating table with a view of forming a transitional government which will lead to a free and fair election with necessary reforms in place. I doubt very much whether they will take care or solve the political impasse currently prevailing. This is the same regional board which endorsed Mnangagwa's leadership. The torture, harassing , beatings and arbitraly arresting members of the opposition will not solve and fix the ailing economy. In a country where people are wallowing in poverty the President charters a very expensive plane to Russia. The youths are unemployed , no industries are functioning at full throttle and there are no signs that the economy will bounce back any time soon. The revival of our economy does not need Zanu PF alone. It has been proved that the revolutionary party is clueless and cannot go it alone. Our economy is a mess. It is also embarrassing that the court papers have also confirmed that youth leaders from Zanu PF were allegedly behind acts of violence and arson, including the burning of a Zupco bus in Harare on Monday during these countrywide protests against fuel price increases. It also confirms that what is happening in the country is not affecting one side of a political party but everybody. Neither the closure of Internet nor killing will ever solve this challenge. It is actually gross abuse of democracy and surprisingly the President posted his message on his Facebook account when the whole country has been blackened out. How would he expect people to read his thoughts when the majority could not access Internet. The junta government has failed and no amount of intimidation will silence the people when the time is ripe. Mnangagwa came from a disputed election and from that time he has been facing a barrage of challenges in running the country. The Mnangagwa's government has taken it too far and is no differrent to the former Robert Mugabe's government. The Zimbabwean crisis needs a quick response and Sadc must not keep quiet and fold their hands. No need for silent diplomacy. We condemn the security forces heavy handedness on protesting unarmed civilians. We stand with the people of Zimbabwe in demanding their democratic rights of expressing their needs. The door to door visits by the police and the army where they were beating up people and shoving them cannot be tolerated. It has been reported that a number of people got injured and quickly need medical attention. The question remains- Will President Emmerson Mnangagwa be forced again to set up a Commission of Enquiry? The behaviour of the Zimbabwe's government to accuse the opposition Movement for Democratic Change Alliance for the outbreak of violence in the country is out of order. Everybody has been affected by the poor performance of the economy and later alone the hiking of fuel price which has been announced by President Emmerson Mnangagwa before he left for Russia. It is the Zimbabwe Congress of Trade Union which called for a complete shutdown of businesses and work citing low wages, poor transport service and high cost of living.